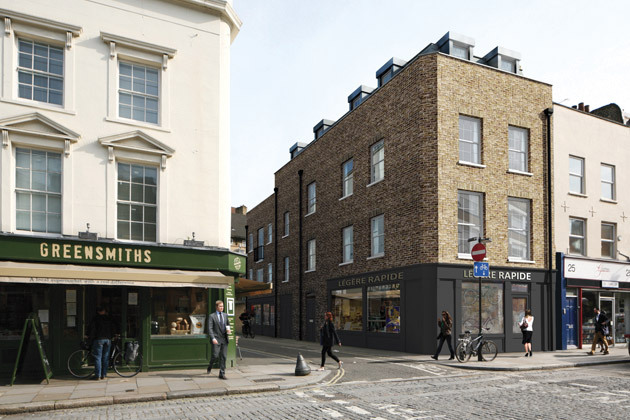 Tuke Manton Architects were appointed in 2008 to advise on and prepare scheme proposals for refurbishment and redevelopment for 26 Lower Marsh, London SE1 just south of Waterloo. 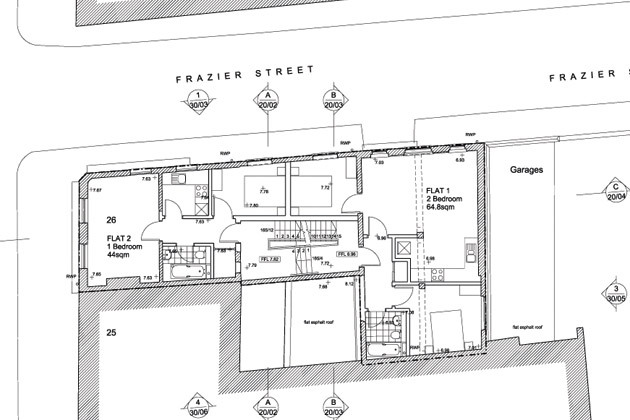 After a long negotiation period and several planning applications the scheme achieved approval in September 2011. The new building started on site in April 2012 with a build contract of 12 months. Lower Marsh is a vibrant street consisting of terraced buildings which, on the whole, have retail units at ground floor. This is complimented by market stalls that contribute to the area’s lively street scenes. Upper floors are largely residential with the occasional commercial use. No. 26, Lower Marsh is a three-storey Victorian building that originally had retail use on the ground floor with residential use on the upper floors to the front half of the building and workshop use to the rear. The ground floor extends the full depth and width of the site, as do the upper floors. 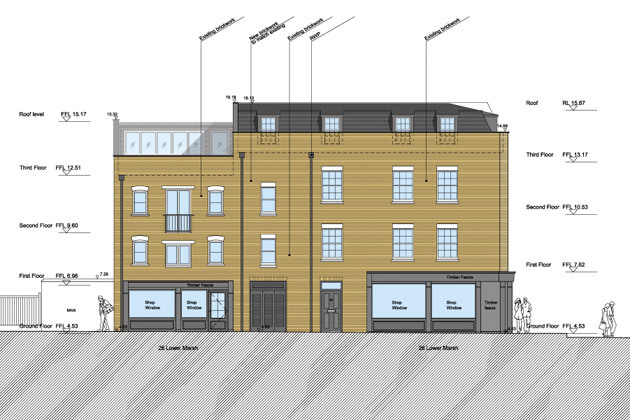 The proposal is to demolish part of the existing building on the site leaving the façade to Lower Marsh and the façade to Frazier Street, the masonry will be retained in its entirety. The new building will tie to these elements and retain the existing scale to Lower Marsh with the addition of roof level accommodation. 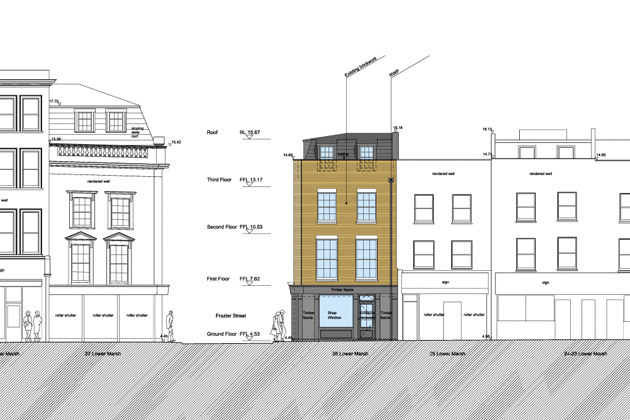 This is designed to be within a traditional mansard-type roof, designed to terminate the Lower Marsh terrace. The arrangement provides a retail unit at ground and basement level with entrances from Lower Marsh and Frazier Street. The entrance to the residential accommodation is via a hall that leads onto individual bike stores and a stairway. The upper storeys comprise of a mix of 1 bedroom and 2 bedroom accommodation. 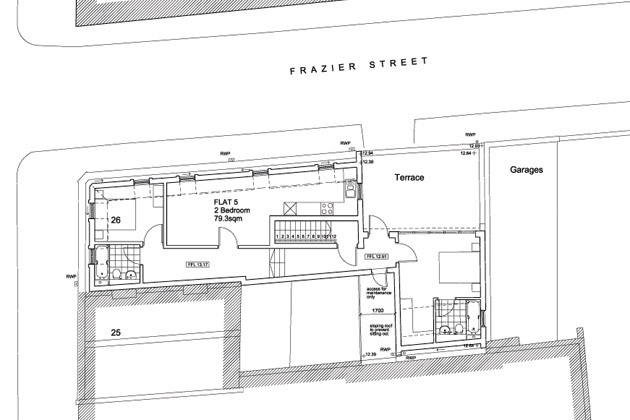 The scale of the proposed new building along Frazier Street increases the height of the ‘central zone’ (currently two storeys) by two storeys, thus making it a part of what is considered the ‘front’ main building on Lower Marsh. A traditional mansard roof and continuous parapet over this block pulls the building elements together creating an appropriately dominant corner presence. In subordination to this the rear three storey building on Frazier Street is retained at its existing height and only added on to at the back by a rooftop extension. This additional storey is not visible from street level as it is set back considerably from the front parapet. The existing building is in a state of considerable dilapidation and has been damaged by fire and water in addition to the general neglect and vandalism suffered under its previous ownership. In this respect the proposed development renews a considerable amount of uninhabitable space in the city. It retains existing fabric where viable. The thermal performance of the proposal will be considerably improved to meet current building regulations and there is a good use of natural light, given the contextual restrictions. In this sense the proposal is considered to be a highly sustainable use of the site.